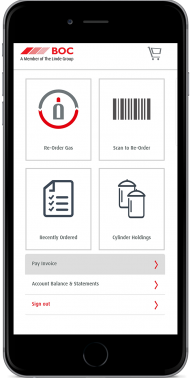 Try the new BOC Re-Order Gas App and complete your orders in just 2 steps. No need to remember your password! After signing in the first time, you'll always be signed in to the app on your subsequent visits. Still with the familiarity of the App that you knew before, it now comes with a more intuitive, simpler and cleaner look. Re-ordering your gas just got even faster. Simply scan a barcode or select from existing cylinder holdings. Re-ordering done in 2 steps! Use the same login details on the App and get more done on the go using your smartphone. 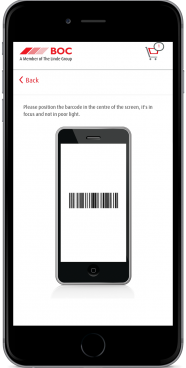 Scan cylinder barcodes to identify if they belong to your account. Get instant copies of your invoices and pay them online. Re-ordering your gas cylinders has never been this quick or easy. 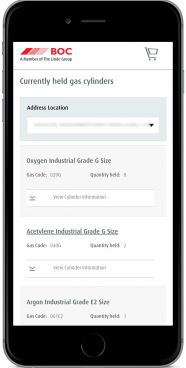 Manage and keep track of your cylinder inventory. Available to download from the App Store and Google Play for iOS and Android. Not Registered for BOC online? Register in the App or register online.